Tresorit offers a highly flexible and secure cloud storage solution that can be as useful to individuals as teams and whole businesses. Unfortunately, based on the current trend to cheaper online storage, this is one of the more expensive options. Each supplier of cloud storage makes a series of choices about the service they provide and how it differs from what others are doing. Tresorit is a Swiss-based business were the focus was placed on two aspects that it considered important to its customers, security and simplicity. But, can it deliver those things in a way that’s relevant to modern business and elegantly enough to overcome the lure of big brand names? We take a look at Tresorit and explore how its approach is an interesting one that might fit well with some business profiles. For a new user, the Tresorit interface shouldn’t be anything too far removed from those they might have already encountered on Google and Microsoft’s cloud storage solutions. You can use web-based access, or a desktop application on Windows, Mac and Linux that offers almost identical functionality. Files and folders can be uploaded and shared with others, and those links can be given an expiry date and a password. Where other systems have ordinary folders, Tresorit has ‘Tresors’. These are a collection of files and folders that you wish to organise, share and distribute as one. This feature hints at how flexible the Tresorit model is, as you can link and sync any folder or file from your computer and build a specific Tresor that includes those. And, you can make multiple Tresors that might contain subsets or supersets of the folders you have available. 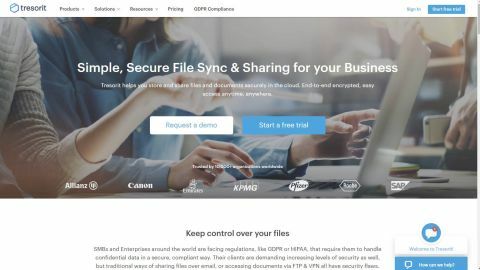 We like this approach, as not every file you might want to secure or share might be under the same document subfolder, and this gives you the ability to bind ad hoc locations, including those from networked drives. And, the sync is bi-directional, allowing you to collaborate with others and get the latest versions of files that others have edited. When you install the desktop client, along with that tool the installation code also establishes a network drive connected to the top level of your Tresorit storage. The difference between this and those folders that you’ve linked elsewhere is that the files in those folders exist on both the computer and cloud servers, where files written to the virtual network connection are resident only on the cloud. An advantage of using the network drive is that most desktop apps should be able to easily interact with it, and you don’t need to create an implicit link to secure any files created through it. Tresorit also has options for mobile devices, with apps on both Android and Apple. These provide mobile access to the cloud stored files, and you can also secure data from these devices to the cloud. What Tresorit doesn’t address are those customers who want to collaborate on the same documents simultaneously, and it also doesn’t have any special integration features for those that use CRM or groupware tools. It integrates to Outlook to create smart file attachments, but that’s about it for reaching out to other apps. Encryption on Tresorit is certainly a strong point of this solution. It uses an end-to-end encryption scheme where all files and metadata are protected using randomly generated encryption keys that never travel in an unencrypted form. Therefore, even in the highly unlikely event that files are intercepted along the way, decryption is only possible with a user’s unique decryption key. As an extra level of protection, Tresorit clients apply a Message Authentication Code (MAC) to each file’s content, and this code is held only by the client and those the file is shared, but not kept by Tresorit. This ‘blind’ or ‘Zero-knowledge’ approach has the advantage that should the worst happen and Tresorit is hacked, the files won’t be accessible to those that gained access to the servers. The downside to doing this is that should a client forget their key, Tresorit hasn’t any backdoor or passkey to unlock them, ever. In the world of cloud storage, that’s what is considered proper security. For those interested, while Tresorit is registered in Switzerland and all the Microsoft Azure datacentres, where the customer data resides, are in located in Ireland. That makes them subject to some stringent local data protection laws in both respects, and Microsoft has provided certified storage that is protected against physical attacks, environmental calamities and is a fully redundant platform. Tresorit is also certified for ISO 27001, providing compliance with GDPR and HIPAA for those businesses that must adhere to those standards. The other part of the Tresorit security model is a security templating system that allows an administrator to control and monitor users, force 2-Step verifications, and dictate what hardware can access the cloud storage. Machines and users can be disavowed, should that be necessary. Compared with some of the cheaper options, Tresorit takes security seriously and has taken extensive steps to make sure that it maintains a well-protected platform. Tresorit has two different payment models that address cloud storage for individuals or teams. The personal plan has a start rung called ‘Send’ that allows you to dispatch files of up to 5GB to others and is free. There are two paid tiers for single users, Premium and Solo costing £6.67 ($10.42) and £16 ($24) per month respectively if you pay annually, and £8 ($12.50) and £20 ($30) if you pay monthly. Premium gives you 200GB of space and access for five devices, along with the full security features including 2-factor authentication and zero-knowledge keys. Solo boosts the storage to 2,000GB, the devices to ten, and expands the recoverable file versions from 10 under Premium, to unlimited. Thus making it perfect for a freelancer or professional wants to have secure cloud storage as part of their day-to-day operations. For team use, Tresorit has designed three plans designated as Small Business, Business and Enterprise, that are for 2+, 10+ and 100+ users. These are charged per user/month and add greater administration control as the number of users increases. Currently, the best value is the Business plan at just £8 ($12) per user/month if paid annually. With it, you get 1,000GB of space and ten devices per user, plus unlimited file recovery, Active Directory integration, HIPAA compliance and even custom branding. For the scale of storage space that a small team could accrue, and the level of security on offer, this seems like an attractive offer. Enterprise customers pay £24 ($24) per user/month paid annually, and for that, they get to decide how much storage is required and how the system is customised to meet their business processes. As part of the Enterprise plan, Tresorit also has personalised staff training and access to the Admin API for bespoke integrations. Even with some of the deals on the Business plan, this is an expensive option for the relatively small amount of default space per user. And, the overhead for paying monthly is high, too. Price is probably the biggest issue for Tresorit, as the functionality it offers was well-designed and reliably coded. Cost aside, this could be the ideal solution for those users and businesses where sort-of-secure file storage doesn’t quite cut it. However, it is expensive, and some businesses will expect great app integration than Tresorit currently delivers.